C. rugosperma of Michigan Flora. Generally in dry sandy (sometimes rocky) ground, including fields, stabilized dunes, and open oak, aspen, or pine forests and savannas; mostly in acidic soils. Plants with thick, short, rigid leaves and perigynia glabrous or nearly so are var. tonsa in contrast to var. 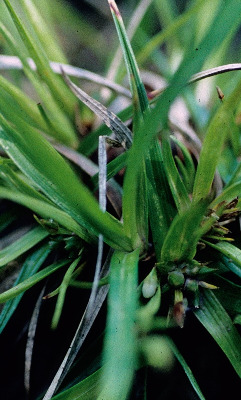 rugosperma (Mack.) Crins with long, thin, flexuous leaves and pubescent perigynia. 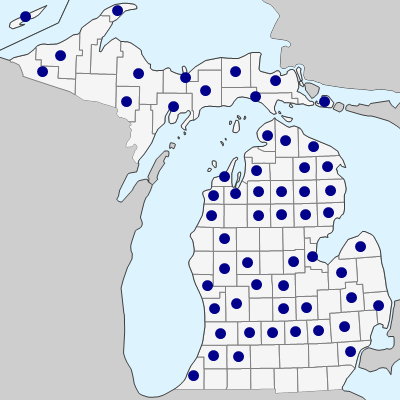 Both varieties occur throughout Michigan; occasionally occurring together, but with the var. tonsa favoring dry open barren habitats. Early fruiting and inconspicuous, like the similar C. umbellata, and doubtless much overlooked. MICHIGAN FLORA ONLINE. A. A. Reznicek, E. G. Voss, & B. S. Walters. February 2011. University of Michigan. Web. April 24, 2019. https://michiganflora.net/species.aspx?id=1067.